One of the biggest challenges faced by many Photoshop Elements users is the knowing where to start a project. People buy Photoshop Elements because they want to make beautiful things with their photos and to share them with friends and family. But for many part-time creatives (hobbyists, novices, amateurs etc.) the prospect of starting from a blank canvas is terrifying. The Photoshop.com Inspiration Browser was introduced with Elements 7 to help alleviate this problem. The user experience actually relies on two related features. The first feature is Inspiration Pods, which are contextually-based messages which appear in the lower right hand corner of Photoshop Elements, Organizer and Premier Elements. The Pods deep-link to contextually relevant tutorials hosted in the Inspiration Browser. 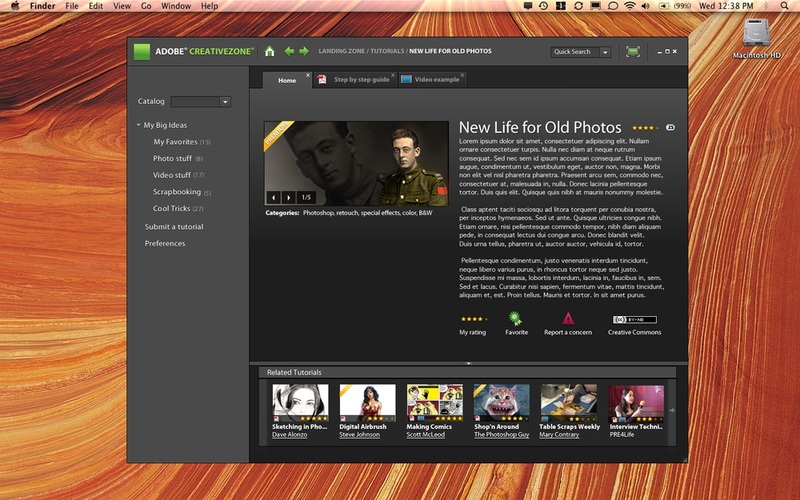 The Inspiration Browser its self is a stand-alone application built on Adobe’s new AIR integrated run-time. The 1.0 version of the Inspiration Browser is a simple tutorial browser which allows users to access both PDF and Flash video tutorial content submitted by Adobe, elements users, and third parties. The cool thing about the Inspiration Browser is that since its built on AIR, it can easily be updated with new features and functionality over time. The user can filter the number of tutorial results dynamically by user rating and can browse results in a list or grid view. Some tutorial content is limited to Elements Member Services Plus subscribers. Add to favorites allows users to save tutorials for later access. This rating reflects the community rating for the tutorial.